Japan on Saturday made it clear to India that it would walk out of the proposed civil nuclear deal if the latter conducted another nuclear test and pressed for an early ratification of the CTBT by New Delhi. The government today introduced a Representation of People (Amendment) Bill 2010 in the Rajya Sabha, which seeks to provide voting rights to Indians living abroad and would enable them to register their names in the electoral rolls. India may have given to the world the concept of zero but has drawn blank when it came to securing top prizes in mathematics at the ongoing International Congress of Mathematicians here. The Rajya Sabha today passed a Bill for establishing a transnational university at Nalanda in Bihar, which w as a seat of learning in ancient India. India along with 16 countries of East Asia would like to see Nalanda as "an icon of Asian renaissance". Contrary opinions should not be ignored if challenges and opportunities have to be met in the process of national development, Prime Minister Manmohan Singh said today. Agitating members of the Lok Sabha, who held a mock Parliament inside the House yesterday to protest against ‘paltry’ salary hike and the government pushing the Medical Council of India Bill, withdrew their agitation today after an assurance from Union Finance Minister Pranab Mukherjee to consider their demands sympathetically. India has unequivocally conveyed to China that the Dalai Lama is an honoured guest in this country, who is not supposed to indulge in any political activity on the Indian soil. Former Minister of State for External Affairs Shashi Tharoor will tie the knot with his fiancée Sunanda Pushkar in a quiet ceremony at his ancestral home in Elavanchery village in Kerala’s Palakkad district tomorrow. Wedding preparations are in full swing at the 200-year-old ancestral home, known as Mundarath House. Four children died today after being administered anti-measle and other vaccines during a government immunisation drive in the Mohanlalganj area on the city outskirts, prompting authorities to suspend five medical staff. Sugar co-operatives in Maharashtra controlled by politicians cutting across party lines are expected to be major beneficiaries from the Centre’s decision to allow public sector oil companies purchase ethanol at Rs 27 per litre for blending with petrol. Faced with problems of mobile telephone connectivity in posts located in the remote areas, the Army has decided to have its own mobile network in locations along the border with Pakistan and China. The Indian Navy is helping the tourism department of picturesque frontier state of Arunachal Pradesh to promote adventure tourism in various water bodies in the state at the initiative of state Governor Gen JJ Singh (retd). Bihar Chief Minister Nitish Kumar has challenged UPA Chairperson Sonia Gandhi to specify with facts and figures that Bihar had been given any extra financial assistance from the Centre other than the gross budgetary support, which is the legitimate share of all states, including Bihar. Embattled Environment Minister Jairam Ramesh on Thursday found support for his environmental concerns for the contentious Navi Mumbai airport project from unexpected quarters - the Congress’ arch rival in Mumbai, Shiv Sena. The Union Ministry of Road Transport and Highways with the assistance of the National Informatics Centre is developing a national portal for issuing of national permits so that a uniform system can be adopted throughout the country. National Human Rights Commission (NHRC) chairperson and former Supreme Court Chief Justice KG Balakrishnan held a meeting with representatives of state human rights commissions recently and asked the state governments to take steps to strengthen these. Anjenary, believed to be the birthplace of Lord Hanuman, will be developed as a tourism centre in view of the Kumbh Mela here in 2014-15. Unidentified gunmen shot at and critically injured a passenger and looted valuables and some mobile sets from others travelling by Jhajha-Gaya passenger train at Bansipur railway station in Bihar's Lakhisarai district late last night, Deputy Superintendent of Police (Railway) K K Sharma said. Around six gunmen boarded the train at Bansipur railway station and went on a looting spree, Sharma said. Visiting Japanese Foreign Minister Katsuya Okada held the fourth round of strategic dialogue with External Affairs Minister SM Krishna today. The two sides discussed the nuclear pact, comprehensive economic partnership agreement (CEPA), other bilateral and international issues, including UN reforms and the situation in Afghanistan and Pakistan. However, the focus was clearly on the nuke deal, the discussions on which the two countries propose to conclude as quickly as possible without setting any timeline. Addressing a joint press conference with Krishna after the three-hour talks between the two sides, Okada candidly admitted that initiating negotiations with India on the nuclear pact was the toughest decision he had taken during his stewardship of the Japanese Foreign Ministry, given the fact that India was not a signatory to the NPT. He also acknowledged that the proposal for a nuclear agreement with India was facing sharp criticism back home, since Japan is the only country to have experienced a nuclear attack. He also told the Indian side that the philosophy of nuclear disarmament and non-proliferation must be incorporated in the proposed accord on nuclear cooperation. “I also conveyed to the Indian side the importance Japan attaches to India’s early ratification of the CTBT,” said the Japanese minister. On his part, Krishna said the two sides were working towards reaching a nuclear pact that would result in a ‘win-win’ situation for both. He also thanked Japan for removing 11 Indian entities from their ‘end-user list’, saying the move would help boost high technology trade between the two countries. On the CEPA, the two countries decided to speed up the negotiations so that it could be concluded by the time Prime Minister Manmohan Singh visits Tokyo later this year. Japan assured India of its continued assistance for projects like the dedicated freight corridor, Delhi-Mumbai industrial corridor and the establishment of IIT, Hyderabad. The two countries will continue and enhance consultations within the G-4 process for reforms of the UN, including the Security Council. They also welcomed the inclusion of the US and Russia in the East Asia Summit (EAS). Under persistent demand for voting rights from Indians living outside the country, the Representation of the People (Amendment) Bill 2010 was introduced by Law Minister M Veerappa Moily. Moving the Bill, Moily explained the details regarding the manner of enrolment of non-resident Indians (NRIs), the mode of voting and conditionalities for contesting elections. The government had earlier withdrawn the Bill in 2006, saying it did not have enough information regarding modalities on conferring voting rights to NRIs. The Bill was aimed at providing Indians, who have not acquired the citizenship of any other country and are away, entitlements to have names registered in the electoral rolls. None of the Indians figured in the hall of fame at the ICM-2010 which gave away seven awards for outstanding contributions in mathematics. They include four Fields Medals, considered equivalent to Nobel Prize and given once in every four years to mathematicians below the age of 40 years. For a country that takes pride in being the land of Aryabhatta, Bhaskara and Ramanujan and a reservoir of traditional knowledge, it was once again a disappointing fare as top honours continued to elude Indian mathematicians. Though three mathematicians of Indian origin — Manju Bharghav (Canada), Akshay Venkatesh (Australia) and Kannan Soundar Rajan (USA) — were said to be in contention for the medals, but they could not make it finally. The prestigious Fields Medals, given since 1936, were bagged by Ngo Bao Chau of Université Paris-Sud, Orsay, France, Cédric Villani of Institut Henri Poincaré, Paris; Elon Lindenstrauss of Hebrew University, Jerusalem, Israel, and Stanislav Smirnov of Université de Genève, Switzerland. The Fields Medals, the most sought-after in the world of mathematics, were given for solving math problems that had eluded solution for at least a decade. The Rolf Nevanlinna Prize, given once every four years for outstanding contributions in mathematical aspects of informational sciences, was bagged by Daniel Spielman of Yale University, USA. Carl Friedrich Gauss Prize for applied mathematics, which was first awarded at ICM 2006 at Madrid, Spain, was this year given to Yves Meyer of École Normale Supérieure de Cachan, France. The Chern Award for lifetime outstanding achievements in mathematics was won by Ouis Nirenberg of Courant Institute of Mathematical Sciences, New York University. A key highlight of this year’s Congress is the Chern Medal, instituted with the highest prize money of $500,000 (Rs 2.33 crore). Louis Nirenberg received it for his contribution to differential equations. The Rajya Sabha today passed a Bill for establishing a transnational university at Nalanda in Bihar, which was a seat of learning in ancient India. India along with 16 countries of East Asia would like to see Nalanda as "an icon of Asian renaissance". 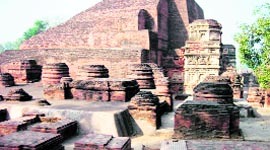 Perceived to be an amalgam of ancient and modern thinking, it will be guided by an interim governing board, chaired by Nobel laureate Amartya Sen.
Nalanda, situated 90 km south east of Patna, near a village called 'Bada Gaon', still has the ruins of the ancient Nalanda University, which, according to studies, existed in the fifth century AD. The studies also said the ancient university had 10,000 students and facilities like nine-storeyed library building. The Nalanda University Bill, 2010, which seeks to establish a teaching campus on 441 acres attracting students and faculty from across South and South East Asia, was passed by the House after a scholarly debate. The debate saw Karan Singh (Congress), Sitaram Yechury (CPM), NK Singh (JD-U) and M Rama Jois (BJP) at their erudite best recalling India's rich contributions to the culture and civilisation of the world. Quoting the head of the Mentor Group, Amartya Sen, the JD-U member said, "When Oxford (UK) was being inaugurated, Nalanda was being destroyed -- it did represent transition of knowledge from Asia to Europe. We want to rebuild Asia and regain knowledge leadership. Nalanda will become an icon of Asian renaissance." Replying to the debate, Minister of State for External Affairs Preneet Kaur said prominent academicians would be involved in the university, which will be housed in a complex to be built on a design to be chosen through an international competition. "Our focus has to be on Buddhist studies… A school of Buddhist studies has to be established," Kaur said. However, several members emphasised that the new Nalanda University should reflect the modern needs of the 21st century. "Buddham, sharanam gachchami (I take refuge in the Buddha), alone will not suffice," Ram Vilas Paswan (LJP) said. Maintaining that the country has shown the capacity and resilience to overcome trials and tribulations, he said “we have withstood serious challenges on the economic and security front and even emerged stronger afterwards”. Releasing a book-“Keeping the Faith: Memoirs of a Parliamentarian” authored by former Lok Sabha Speaker Somnath Chatterjee here, Singh said “if we are to rise above natural orthodoxy of government functioning, then we should not shy away from a constructive debate of different points of view. The PM’s remarks came against the backdrop of differences among political parties over various issues. “One of the issues that faces the Indian polity is how to make the functioning of Parliament more effective and meaningful,” Singh, who was flanked by Chatterjee and Lok Sabha Speaker Meira Kumar at the function, said. Among those present at the function were UPA Chairperson Sonia Gandhi, Deputy Chairman of Rajya Sabha K Rahman Khan, Singh’s wife Gursharan Kaur, Chatterjee’s wife Renu and former Speaker Balram Jakhar. Chatterjee, who has launched a vitriolic attack against CPM leader Prakash Karat in the book for “disastrous” policies that led to the Left debacle in 2009, however thanked his parent party for having fielded him for 11 consecutive terms as Lok Sabha candidate. But there were clear indications that the government was not going to concede their demand for raising their salaries to Rs 80,001 and instead would stick to the decision of the Union Cabinet, nor would it revert the MCI Bill back to the House, said sources. As for the MCI Bill, passed yesterday amidst slogan shouting, the government offered to have a discussion on the functioning of the MCI under Rule 193. Similarly, on the salary and other allowances too, some minor sops may be offered in allowances, “But they would be nowhere close to what we want,” said a JD-U MP. “It will be an eyewash. But how long can we break our heads on this. Finally, we will accept whatever is offered. We can’t raise our salary issue everyday,” he added. The MPs led by Lalu Prasad (RJD), Mulayam Singh Yadav (SP) and Gopinath Munde (BJP) met again in Parliament today and were also joined by Leader of Opposition in the Rajya Sabha Arun Jaitely and JD-U president Sharad Yadav. They then met Pranab Mukherjee and raised their concerns with him. Once Mukherjee promised to look into their demands, the agitation was called off. Later Sharad Yadav, Lalu Prasad and Munde separately stated that the matter had been resolved amicably, with Munde saying that the salary hike has been left to Mukherjee. “Whatever decision he takes after holding discussions...He will also hold deliberations with others,” he said. Krishna was asked if Prime Minister Manmohan Singh had met the Dalai Lama on August 11, over which China is reported to have protested. He said that at his recent meeting with his Chinese counterpart he had reiterated that New Delhi did not encourage the Tibetan leadership to indulge in political activities, which would concern the relationship between India and China. “The Tibet Autonomous Region is part of the Chinese republic. I think that should bring down the curtain on any controversy," the Minister added. “We are all busy as Shashi Tharoor is coming. All his relatives are here and we are going to celebrate Onam together in a big way,” said Jayasankari Amma, Tharoor’s grandmother. Tharoor’s early morning marriage ceremony will be attended by close family and friends and then the couple is expected to leave for his constituency Thiruvananthapuram for the reception on August 23. Union Health Ministry will send a two-member team to Lucknow to probe the deaths, a senior official said in New Delhi, adding that “most stringent action” will be taken against those found guilty. “Four children in villages of Mannawa, Rampur and Khera died shortly after they were administered measles, BCG and Hepatitis B vaccines by a team of government medical staff,” Director General, Family Welfare, SP Ram, said here. At present, the PSU oil companies are purchasing ethanol at Rs 21.60 per litre. Most of the ethanol to be used for blending with petrol is expected to come from Maharashtra, which will supply nearly 15 crore litres of ethanol with immediate effect. Within a year’s time, Maharashtra would be able to supply as much as 80 crore litres of ethanol after all 55 ethanol factories up capacities, according to Prakash Naiknavare, managing director, Federation of Cooperative Sugar Factories, Maharashtra. “We will utilise the idle capacities in our distilleries to produce ethanol,” Naiknavare said. According to the federation, 35 of the 55 factories in the state are linked to sugar co-operatives in the state. Apart from Union Agriculture Minister Sharad Pawar, Union Heavy Industries Minister Vilasrao Deshmukh, BJP president Nitin Gadkari, and senior party leader Gopinath Munde are among those who control sugar co-operatives in the state. All factories run by co-operatives have installed state-of-the-art equipment to produce ethanol from molasses - a byproduct of sugarcane. According to sources, these factories can also produce ethanol directly from sugarcane, if required. Meanwhile, the sugar co-operatives in Maharashtra are pushing for ethanol blending to be increased from 5 per cent to 10 per cent. “Ethanol blending in petrol can be raised from five to 10 per cent as sugar co-operatives increase capacity,” says Vijaysinh Mohite Patil, a politician who heads the Ethanol Manufacturers’ Association of India. A social activist from Aurangabad has filed a public interest litigation before the Bombay High Court challenging the Maharashtra government’s subsidy for producing alcohol from rotten foodgrains. In his petition, activist Chetan Kamble has alleged corruption in the policy formulated in 2007 under, which sugar co-operatives are given subsidy to purchase rotten foodgrain to produce alcohol. The state provides a subsidy of Rs 10 per litre of alcohol produced from such food grains. Kamble has alleged that foodgrains are deliberately allowed to rot so that they could be diverted to produce alcohol. There are around 25-30 distilleries in Maharashtra that have the capacity to produce alcohol from foodgrains. The Army has floated a tender asking mobile service providers to submit their proposals for technical and commercial information for such services, along with equipment and related infrastructure. The Army also intends to have three “cellular circles” of its own in northern and north-eastern regions of the country. The idea is to have secure communication that is not “interceptable” by the enemy and also to connect the same on the Army’s existing network of landline phones - ASCON network. At present officials in remote forward posts are dependent upon telecom service providers for mobile connectivity, which is very unreliable in such areas, said a senior official. “How can one even imagine that some private company will expand its network just to meet the Army needs? The time has come to have our own mobiles,” he added. Regions identified for implementation for mobile services are Assam, Arunachal Pradesh and Meghalaya besides the areas bounded by Dibrugarh, Phek, Champhai and Karimganj in the states of Assam, Nagaland and Mizoram. The Army is also looking to have the system in Jammu and Kashmir around Sonmarg, Loma, Leh, Batalik, Drass and Partapur - the last one being the base camp to Siachen. It is estimated that the Army will give these mobiles to about 21,000 users across these three zones. The connectivity is needed for voice and data transmission while the technology sought is CDMA. The Army is looking for handsets and equipments that will be operated at specific frequency and a system that provides seamless roaming facility while having ability to operate in extreme temperatures. It is also looking to have some sort of limited integration for connectivity with civilian mobiles. Since it is for critical defence needs, the Army has laid down a strict guideline asking the vendor to be a registered company with operations in India. The foreign holding in the company and its subsidiaries, if any, cannot exceed 26 per cent. Notably, it has also asked the company to supply a list of equipment from where it has been sourced from. Just a few weeks ago the Home Ministry had banned telecom equipment manufactured by Chinese companies. The Governor has requested Vice-Admiral of Eastern Naval Command Anup Singh who was on a maiden visit to the hill state, to set up a naval wing of the National Cadet Corps (NCC) in the land-locked state where the Indian Navy doesn’t have any presence so far. While seeking the cooperation and technical guidance from the Navy for promotion of adventure tourism in various water bodies in the state, the Governor has suggested setting up of an Indian Navy unit in the state from the nearest headquarter. Stating that the Indian Navy is hitherto unknown to Arunachal Pradesh, the Governor requested the visiting naval officer for technical advice and training to local people for promotion of adventure tourism and water sports in the state. The former Army chief said the Navy should begin the mission at Ganga Lake in the state capital Itanagar followed by other lakes, including Sela and Sangesor lake in the bordering district of Tawang. State Chief Minister Dorjee Khandu said his government would look forward for a joint effort with the Navy for promotion of adventure sports and tourism in water bodies of the state. The Indian Navy is taking up hydrographic survey of Ganga Lake for earmarking the unsafe portions by installing buoys. Vice-Admiral Anup Singh stressed on installing sinkers to mark the underwater plants in the lake. He also assured all technical support from the Navy adding that a few sailors and officers from the Navy would be deputed for the purpose. Reacting to Gandhi’s remarks made during the Congress Parliamentary Party meeting at New Delhi on Thursday wherein she reportedly said Bihar had never been given so much of financial assistance from the Centre, Nitish said he was ready for a debate on this issue with the UPA Chairperson and all such union ministers who had been making a false propaganda about providing a lot of money to Bihar for its various development and welfare schemes. “The fact is that Bihar had not even been paid the money (around Rs 1000 crore) that it had spent on repairs of the National Highways passing through the state,” Nitish added. Continuing in the same vein, the Bihar Chief Minister charged the Centre with having a discriminatory attitude towards Bihar and attacking the federal structure. He said the Centre had not paid any heed to the state’s demands for the rehabilitation and reconstruction package for the victims of Kosi disaster for the last two years despite the fact that the Prime Minister had declared the Kosi deluge a national calamity in the presence of the UPA Chairperson after their aerial survey of the flood-affected areas in 2008. Addressing his party workers during the concluding day of the JD(U) state level workers camp at Rajgir, Nitish claimed that the Bihar government had initiated around 40 development and welfare schemes for its people exclusively from its own resources and the Centre’s contribution to these schemes was “Zero”. Nitish also gave a call to his party workers to apprise people about these facts and not allow the opposition parties, including the Congress, to make such false claims during the ensuing election campaign in Bihar. A Rajya Sabha member of the Shiv Sena said his party would oppose building of the airport at Navi Mumbai at the cost of environment. Raising the issue during the Zero Hour, Bharatkumar Raut said Ramesh had raised serious objections about the validity of the proposed airport. “I congratulate the Minister of Environment and Forest for taking the bull by horns,” he said, adding that while his party was for development of Maharashtra but not at the cost of environment. “My party will oppose it,” Raut asserted, saying that the Navi Mumbai project was being pursued for benefit of industrialists and politicians who must have purchased huge piece of land at throwaway price and sell it at a premium for the airport project. “This airport will be directly benefiting the industry of Maharashtra and the country. When the industry and industrialists are benefited, why should poor farmers and fishermen suffer?” he wondered. The Navi Mumbai airport project proposed in the public-private-partnership has been hanging fire after two years of Cabinet clearance. Civil Aviation Minister Praful Patel on Thursday told the Lok Sabha that the Centre had accorded “in principle” approval for setting up of a Greenfield airport at Navi Mumbai in 2007. “No time frame was stipulated for the completion of the project. However, in view of the growing traffic and congestion at Mumbai airport, the Navi Mumbai airport should have been operational by 2011, he said. The project is being implemented by the City and Industrial Development Corporation of Maharashtra (CIDCO), an undertaking of the Government of Maharashtra. The Civil Aviation Ministry on Wednesday had sought the intervention of Prime Minister Manmohan Singh and Congress president Sonia Gandhi to make Ramesh see reason over the need for a second airport at Mumbai while a few days back the MPs from the region had also met the PM to voice support for Patel’s pet project. With the Environment Ministry not giving clearance to the project, Patel had also mentioned the issue to the Prime Minister at the inauguration of the T3 at Indira Gandhi International Airport. “Mumbai is our financial capital and needs all infrastructure support,” he said in the presence of both Prime Minister and the Congress chief. Patel had earlier levelled the charge of "obstructionism" against Ramesh. Criticising the Environment Ministry for delaying clearances to the Navi Mumbai project, he said the MoEF's objections over the project were beyond his comprehension. However, instead of improving the situation now seems to be worsening with Ramesh publicly suggesting that the location of the airport project needs to be changed. The project was earlier cleared by the Union Cabinet but ran into rough weather due to objections over a move to remove mangrove forests in the area. The Environment Minister also feels that the Civil Aviation Minister needs to be a little more patient as the environment impact assessment report for the Navi Mumbai airport was submitted very recently, on June 24. Ramesh had also blamed CIDCO for the delay. “The Expert Appraisal Committee (EAC) in its meeting on July 21 had asked for clarifications from CIDCO," he recently said, clarifying that the EAC had to give its report within 105 days after the receipt of complete information. Presently, the permit seekers have to go to the respective office of the respective regional transport authorities (RTOs) to get the national permit after paying an annual fee of Rs 15,000 that allows transporters to run their vehicles throughout the country. The national portal will enable the applicants to get the national permit at a click of the mouse, said Gautam Ghosh, senior technical director, NIC, Delhi. The NIC official, who is among the key person developing the portal, said once operational, applicants would be able to apply for national permits sitting at home instead of making rounds of the office of the RTO. It was only in May this year that the Ministry had fixed the national permit fee of Rs 15,000 a year for a truck. Earlier, the truck operators were required to pay separate fee for each state annually. So the truck operators plying on long routes had to pay permit fee of several thousands, the harassment apart. “Since a part of the revenue earned from the permit fee used to go back to the respective state to improve road infrastructure, some of the states earning nothing from the permits were not getting the infrastructure funds. Now, the fee from national permit was equally distributed,” said an official of the ministry. He said mere the constitution of state human rights commissions would not serve any purpose if these were not provided with sufficient manpower and infrastructure for their effective functioning. He said the states that did not have human rights commissions should take steps to set up these at the earliest. He said the state governments should appreciate that the human rights commissions were meant to facilitate good governance. “They are for the help of the administration and the people of the country to achieve their social, cultural and economic rights,” he said. However, he appreciated that the NHRC had received cooperation from the state governments as 99 per cent of its recommendations were implemented by them. He said the NHRC could assist in providing material and resource persons to the state commissions for the training of their personnel in the area of human rights. There are 18 state human rights commissions in the country and the governments of Jharkhand and Sikkim have recently notified the constitution of such commissions in their states. An NHRC spokesperson said a large number of complaints on human rights violations, lack of manpower, financial and infrastructural resources emerged as major concerns of the state human rights commissions during the discussion. The commissions were of the view that some mechanism should be evolved to ensure uniformity in deployment of manpower, either in accordance with the population or the number of complaints received in each state. Maharashtra Forest Minister Patangrao Kadam said instructions had been issued to the Forest Department to prepare a plan in this regard. Anjenary, located off Nashik-Trimbakeshwar road, is about 23 km from here in north Maharashtra. Considering the growing population of leopards in the district, the government is planning to start jungle safari to attract tourists, Kadam said.